My father had no idea what to do with my hair. Wild curls, fluffy and almost alive with their unruliness, my hair would have taken a very, very trained hand to manage. Of course, neither one of my parents qualified. My poor father, however, had even less of a chance than my mother with his military-style high and tight. He had no chance at all. It didn't help that I was tender-headed. For those of you who don't wrangle coarse, curly hair every day, "tender-headed" is the label cast onto girls who can't manage to handle the ripping, scraping, and pulling necessary with aplomb. I was definitely, thoroughly one of those girls. I would cry and pull away and wince and declaim whomever had the nerve to try to make me look presentable. For my mother, there was an acceptable solution; cut it off. Short hair for days (T-Boz, I still love you!). My father, on the other hand, wanted me to be acceptable above all else. Beautiful, even, if it was possible. Most days he left my wild hair alone. Come pictures or a family event, though, everything changed. He would sit me down on the floor in front of the couch, put something distracting on T.V. He hoped for the best. Brushes, combs, oils, creams, hair ties, rubber bands - every weapon he could find was appropriated and scattered around me on the floor. I remember him pulling my hair taut, smearing some oily, scented product around my hairline, scraping a stiff boar-bristled brush along my skull, my whining hopefully drowned out by the cheerful singing of a candy-coated cartoon. The end result was, perhaps, predictable. My skin pulled taut, my eyes narrowed, my hair so far gone as to be nearly non-existent. The pictures were awful. No, truly. Awful. I don't think even my father approved of the final result. It wasn't pretty, or acceptable. But it also wasn't a curly, fluffy, rat's nest of a disaster. 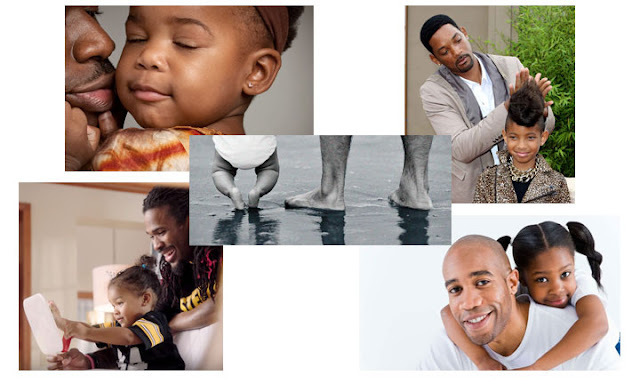 When I sat down to write this blog, this Father's Day blog, this is what came to mind. This image of my classically masculine father sitting down and teaching himself to do something completely outside of his experience or knowledge-base. This image of him looking through shelves and shelves of mystery products, lost in the labels and descriptions and selling points. I see him talking to various sales people, to hair dressers, to anyone who might be able to help him navigate the strange world of his daughter's hair. This is what it means to be a father, I think. And this is why we say thank you. So thank you, dad, and Happy Father's Day! For all of you fathers that sympathize with this and understand the struggle, there a few products that can actually help combat unruly hair! Phyto Petit Detangling Spray for Children is a wonderful dangler that will not have your child's hair experience ending in tears (hopefully), but detangled , shiny and smooth. You can even use a brush that is made to be gentle and still fight those tangles. The Macadamia Natural Oil No Tangle Brush has a unique "flex bristle" design that gently diffuses tangles and knots, painlessly and safely detangling hair. The Curlisto Natural Curls Leave-In Treatment is a good leave-in treatment that will help to keep the frizz and puff gone all day after the groundwork has been laid. These are just a few beginner tips and products, but there are so many more! We can set you up with a whole hair regimen for any type of hair, yours or your child's. We can help you make that special little lady in your life not shed a tear for good hair care.